By Stacey Stein--What makes Jewish Toronto one of the most admired Jewish communities in the world? To answer that question, all you need to do is hop in your car and drive around the city. The inverted teardrop-shaped blue pushpin signs dotting the GTA are hard to miss. Emblazoned with the words “Jewish Toronto Lives Here”, they show the community – in a very explicit way – that Jewish Toronto and UJA are essentially synonymous, indicating the sundry programs and agencies that UJA supports. This amounts to an exhaustive list of more than 100 agencies in Toronto, not to mention the many programs in Israel that are also supported by UJA dollars. Indeed, the quality of Jewish life in Toronto depends on the numerous institutions, programs and agencies that support our community’s diverse range of needs. The engine that powers it all is UJA, creating an inextricable link between the strength of UJA’s Annual Campaign and the vibrancy of Jewish life in Toronto. 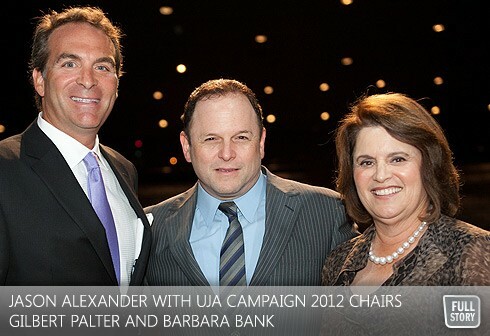 That is the message of UJA’s Campaign 2012 which launched on August 24th at The Sony Centre, and featured actor Jason Alexander. Although it may seem simple, it is in fact a monumental shift in strategy, marking the first time that the campaign messaging aims to tell the whole UJA story by explaining the full range of over 100 initiatives that UJA funds, in addition to the importance of a strong communal fund in ensuring the richness of Jewish life in this city. It is through UJA’s Annual Campaign and these 100 agencies that UJA is able to fulfill its objectives of caring for the vulnerable, building Jewish identity and education, standing with Israel and the Jewish world and leading Jewish and Israel advocacy. Cruise along Bathurst Street and you’ll notice that the pushpin signs blanket a large swath of the city, stretching from downtown all the way to the city’s north end, well into the “905” region. This is another objective of Campaign 2012: to engage the many diverse groups that make up Jewish Toronto, including those living in the “905” area. While this is the fastest growing Jewish community in Canada, it is one that has historically not been as engaged as community members living in the 416 area. A nascent campaign division – the York Region cabinet – seeks to address this gap, and in a short timeframe has already grown from a group comprised of only two lay people to one that boasts more than 20 members. The Chairs of Campaign 2012 acknowledge that while they’re energized by the direction of this year’s campaign, their task has been anything but easy. The community is largely unaware of the remarkable breadth of programs and initiatives funded by UJA. “An overwhelming percentage of the community, including donors, has only a vague notion of the range of initiatives that UJA funds and the connection between UJA and the quality of Jewish life in Toronto,” said Barbara Bank, co-chair of UJA Campaign 2012. There is also the challenge of communicating a substance-heavy message in a way that’s concise and accessible. But clearly the chairs of Campaign 2012 have not only been up to the challenges presented to them by the complexity of this year’s message, they’ve been relishing every moment. And the message seems to be registering with donors, many of whom have responded enthusiastically to Campaign 2012 by increasing their gifts, bringing the current total raised to more than $45 million, from approximately 14,300 donors.